If you are curious, below is a full view of the Terminal window. 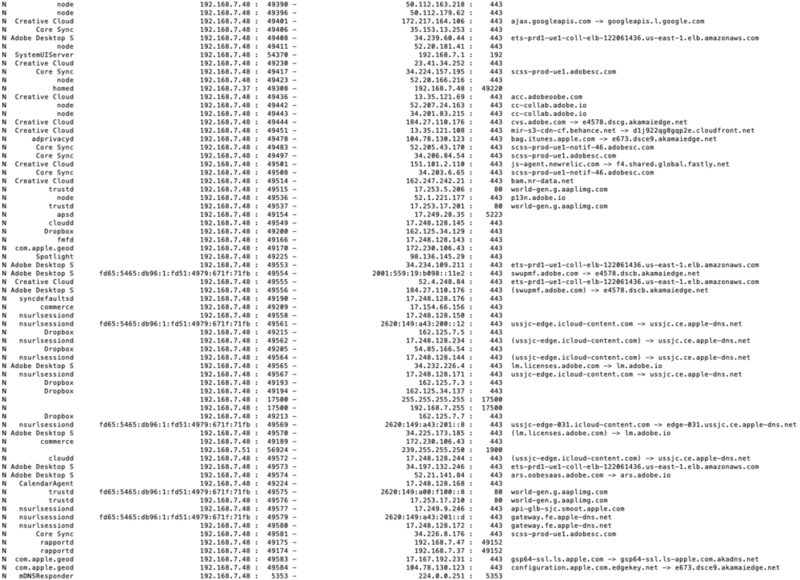 The left column shows the application that generated the network traffic - a neat little Easter Egg Apple throws into its tcpdump data. Each line only shows the first connection to the destination, so the view provides a nice summary of all the different destinations your computer is visiting. Most of the traffic is generated by WebKit, which is used by a number of applications to download and display HTML content from the Internet. Out of curiosity I rebooted my Mac, logged in and only started the Terminal app in order to run SimpleSniffer. Below is a screenshot of the various applications generating network traffic behind the scenes. Your computer is often doing a lot of things on the network that you probably have no idea about. One final observation/question: Why is an application called “trustd” pretty much the only application using unencrypted HTTP (port 80) network connections?